As the spring season arrives, those of growing our own food are faced with one of the great garden dilemmas and controversies: to till or not to till the soil. Tilling, or digging and turning the soil with a shovel, hoe, rake, or tiller, happens in a garden once or twice a year, when the soil is dry and warm. Those in favor of tilling use this approach in their gardens in order to loosen the soil for better drainage, prevent weeds from growing, and amend the soil with nutrients. Those who adopt the “no till” approach believe the soil will actually be healthier with less manipulation. Appearing dormant and inactive, your frost-covered garden beds are actually bustling with life throughout the cold winter months. Microorganisms that balance the soil are hard at work boosting soil fertility, health, and structure. Such microorganisms, like bacteria, fungi, and algae, have their own agenda when it comes to soil health, and when left alone to perform their duties, your soil reaches optimum quality, as it would in its most natural state. This is why many gardeners are in adamant support of the “no till” garden, which approaches seasonal gardening without tilling and turning the soil, so as not to upset the natural order of soil health. This, however, is not a “hands off” approach to gardening or soil maintenance; “no till” gardeners still apply layers of compost, mulch, and other soil amendments to the soil prior to the winter season and throughout, just as decaying plant life and leaves would provide to layers of topsoil in a natural setting. Soil is naturally resilient; air pockets, created from root systems and layers in the soil, assist in nutrient displacement and drainage, as soil purifies and facilitates water in terrestrial systems. These layers in the soil, or horizons, have different characteristics and different roles to play in soil health. Plants thrive and grow in first two layers of soil, called the humus/organic and topsoil, which are comprised of decomposed plant material and mineral-rich organic matter. Beneficial microorganisms settle into these particular horizon layers in order to break down plant matter into supportable nutrients, produce energy by releasing nutrients such as nitrogen, sulfur, iron, and phosphorus, wear down synthetic pesticides and other harmful soil additives, and defeat pathogenic microorganisms that cause plant diseases. When you till your garden bed, you also churn up and mix these vital horizon layers, wreaking havoc on soil’s natural systems, particularly in regards to bacteria and microorganisms. When exposed to surface air due to tilling, microorganisms become oxidized and die off. This initially releases a surge of energy in your soil and causes a rapid spike in soil health, but only for a short period of time. Soon, the microorganisms die, causing soil health to plummet and become nothing more than the dirt on our clothes or under our fingernails. Temperature differentials also greatly affect the microorganisms in soil, which is why those who till must wait until the soil is warm and dry—the rule of thumb is, with every 18 degree rise in temperature, there is a 1.5 to 3.0 percent increase in microbial activity (Carrol/Waddington/Reike). Just as temperature affects microbial activity, so does moisture in the soil. Therefore, turning the soil moves cooler, wetter soil to the top. This warms and dries the newly moved soil, coinciding with the spike in energy that will eventually lead to a complete cessation of activity as the microorganisms die off. If organic gardening and holistic food are your top priorities, try experimenting with “no till” gardening. Get back to the roots of natural food growth. The key to a successful “no till” garden is preventative treatment rather than curing depleted soil—you must tend to your soil yearlong, including late fall, winter, and early spring. Of course, there are reasons why some gardeners prefer tilling soil, such as large-scale crop production, use of synthetic soil amendments, and a strong belief that that system works best. 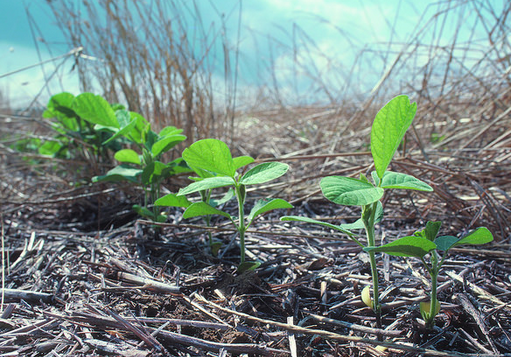 But, the case for “no till” gardening is on the rise; it saves time, work, and, over time, creates an incredibly healthy and self-sustaining ecosystem in your soil. Visit the Bainbridge Island Chamber of Commerce Community Calendar equipped with your planner and a pencil; this April’s crammed events calendar will have you picking and choosing. Within just the first week of April, islanders have already had the opportunity to attend the opening of the Bainbridge Island Farmer’s Market, Composting with John Barutt, Email-a-Tree, and Learn to Row—a Weekend Intensive. Aside from incredibly helpful opportunities with AARP Tax Assistance and the Career Center at the library, take a peak at a few of the events this April has in store for you. Family Fun: Spaced Out, with Stuart Gibbs: Book readings aren’t just for adults. Bring your family to Eagle Harbor Book Company from 7-8 PM to listen to Stuart Gibbs discuss his latest young adult novel Spaced Out, from the Moon Base Alpha Find out what happens when the fate of a stolen Moon Base commander rests in the hands of 12 year-old Dashiell Gibson in this puzzling mystery! Protecting Pollinators with Ann Lovejoy: Be sure to attend this discussion from 7-8 PM at the B.I. City Hall Council Chambers as we move forward into flower, garden, and pollinator Yes, we’re talking about why pollinators—not just bees—are imperative, and in peril. Learn how to make pollinator-friendly private and public gardens with Ann Lovejoy. KRL Presents “Ferry Tales”: This month, join us at the Kitsap Regional Library for John Kennedy Toole’s “A Confederacy of Dunces.” The free event lasts from 4:30-5:15 PM. Community Discussion and Book Signing: “Passings” with Holly Hughes: To welcome Earth Day properly, attend Eagle Harbor Book Co. at 7:30 PM to listen to Indianola Poet Holly Hughes discuss the extinction of fifteen species of birds in her most recent 15-poem chapbook. The passing of these birds is a reflection of our own demise, and a community discussion will hopefully enhance our outlook and input on the environment. Bainbridge Symphony Orchestra Presents: “Movie Music LIVE!”: Performances Friday and Saturday evening at 7:30 will bring to life the music that you know and love film, stage, television, and even video games. A unique musical outing for the whole family, hosted by the Bainbridge Performing Arts Center. Catch a last minute showing Sunday, April 17th at 3 PM. 2016 “Call to the Wild” Gala Auction & Dinner: This 12th annual gala auction and dinner supports the West Sound Wildlife Shelter and their educational and rehabilitation programs. Live and silent auctions as well as raffles and fun activities will bring the Puget Sound community together to support future stewards and philanthropists as well as various environmental non-profits. Rain Garden Basics: A mid-day tutorial on the purpose and promise of rain gardens. Join WSU Extension Rain Garden Mentors at the Kitsap Public Library from 1-3 PM to go deeper in to the aesthetics and engineering of rain gardens, particularly in regards to reduction of pollution and storm water runoff. A Sense of Place: Cascadia and Alaska in a Time of Climate Change: Dan Kowalski will discuss the human connection to our planet—and, in particular, the Cascadia bioregion—at the Bainbridge Public Library from 7-9 PM. A sense of place and a relationship with our natural home can bring greater understanding to our role in climate change. Kowalski’s discussion will emphasize Alaskan glaciers. Pints for Pets at Wobbly Hopps Brewery: Venture to Bremerton for this third annual event, hosted from 5:30-8 PM. $1 from every pour will be donated to the Kitsap Humane Society. Friendly dogs welcome! April’s Bainbridge Fruit Club Meeting: An important event for those of us with fruit trees on our property. Randy Lee will share his expertise on “Renovating Old Fruit Trees,” as well as what to do with fruit trees that have been abandoned or mismanaged. The event is from 6:30-8:30 PM at the Bainbridge Grange Hall. Celtic harps, Rare Instruments, and Wondrous Stories with Lisa Lynne & Aryeh Frankfurter: This San Francisco-based, multi-instrumentalist duo will mesmerize you with traditional and modern takes on folk music, as well as bountiful knowledge of Celtic music, and many stories from a professional career in the music industry. Tickets are $15 in advance or $20 at the door for this event, hosted from 7:30-9:30 at The Dayaalu Center. Trees: The Best Technology for Fighting Climate Change: We all know trees are a powerful, life-bringing force of nature, but do we know of their many abilities to mitigate climate change? Learn with Olaf Ribeiro from 10 AM to noon at Strawberry Hill Center. Bainbridge Island Wine and Cheese Tour: This two-day event, from 10 AM to 5 PM, will feature the seven wineries on Bainbridge Island as well as local cheeses to highlight the tastes of the region. No tickets needed—tasting fees will be collected at the winery. Afternoon on the Trails: Honoring Earth Day, Islandwood opens up their many trails for your self-guided exploration, as well as their Investigation Station to help you and your little ones identify the treasures that you find or take photos of, from cones to shells to leaves. This event, from 1-5 PM, will help you transition from winter hibernation to spring in the outdoors! Infographics: Where Art and Science Meet Climate Change: In a time where memes and images are given more attention to than articles and stories, we must learn how to better our information sharing via infographics. Marilyn Ostergren will discuss her work creating infographics regarding energy, environmentalism, greenhouse gas, and topics of that nature at UW. Learn how to raise awareness on climate change from 7-8:30 PM at the Bainbridge Public Library.